Thea Harrison Simpson was born on October 26, 1928 at her home in the small town of Osmond, Wyoming. She was the first born child to Almon and Mary Chadwick Harrison. Thea had four younger siblings. Kay, Ranae, Orval and Dee. 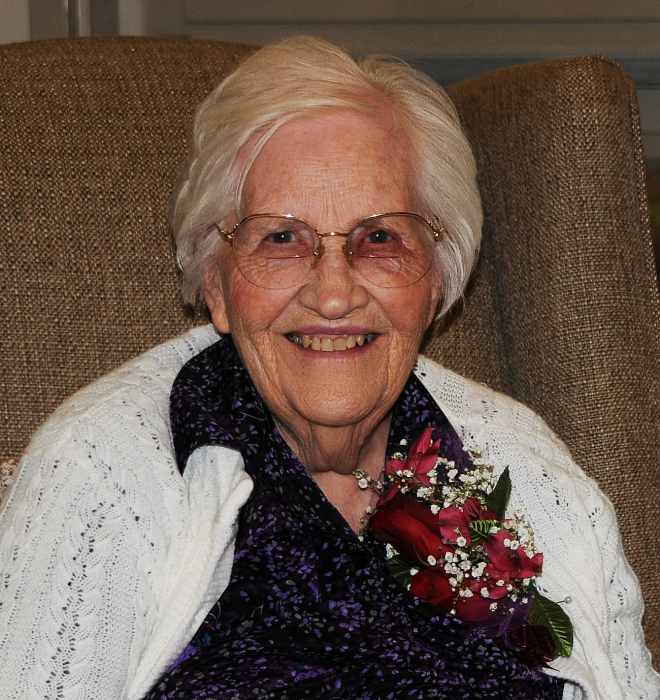 Thea Harrison Simpson passed away on January 29, 2019 at the age of 90. She died from natural causes. Thea grew up in Osmond and Afton. She graduated from the Church of Jesus Christ of Latter-Day Saints Seminary and Star Valley High School in 1947. She later attended LDS Business College. When Thea was 12 years old, her parents bought an old piano for $60. She was so thrilled and started taking lessons right away. She became an accomplished pianist who played in many religious settings. She loved playing the organ at church and especially enjoyed her opportunity over many years to play songs for the primary children to sing. Thea used her talent to enrich her life and the lives of others. She married Boyd Simpson in 1950 and together they raised four sons: Steven, Nolan, Evan and Dahl, who all currently live in Star Valley. Their married years began on the family farm just north of Thayne. After 12 years, they sold their part of the farm to Boyd’s brother Jess. Boyd and Thea then purchased and operated the Farmers Feed Store located in Thayne. They were successful business owners for 27 years. Thea had a valiant testimony of Jesus Christ which was evident in the way she served others. She had a variety of church service opportunities which included ward and stake primary president, pianist for multiple auxiliaries, primary teacher and visiting teacher. In 1990, Boyd and Thea served an LDS church mission to Tennessee. It was a crowning part of their senior years. Upon returning home, they continued their service in the Idaho Falls Temple which lasted for more than 15 years. They loved helping in the church and wanted to set a good example for all their posterity. Thea was preceded in death by her husband, Boyd, her parents Almon and Mary Belle Chadwick Harrison, siblings Kay Harrison and Ranae Bondoc; also daughter-in-law Kathy Schwab Simpson and granddaughter-in-law Crystal Simpson.